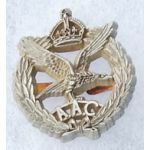 WWII Royal Air Force Air Ministry Constabulary BadgeAbout two inches tall. Enameled details. Looks unused. 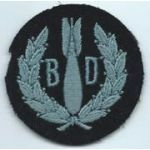 WWII Royal Air Force Bomb Disposal Sleeve Patch. British hand embroidered on dark wool. Unused. 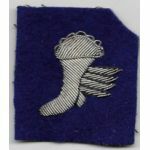 WWII Royal Air Force Dispatch Rider Qualification Patch. British hand embroidered details on wool. Unused. 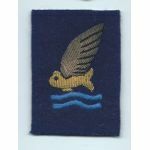 WWII AAF / RAF Goldfish Downed Pilot Bullion Patch. 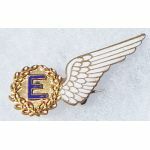 Blue wool background with gold and silver bullion embroidered details. Unused. 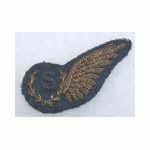 WWII Royal Air Force / RAF Signalier Specialty Patch. English embroidery on grey / blue wool. Unused. 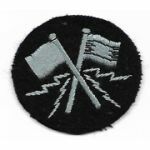 WWII British Reconnaissance Shoulder Title / Patch. British hand embroidered on wool. Used. 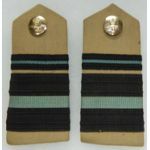 Royal Air Force Air Commadore Shoulder Board Set. 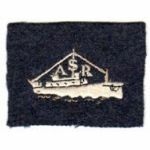 Soft, khaki twill like background with sewn blue and black braid. Look lightly used. Probably 50's period.